By Alfred L. Martin, Jr. The black sitcom is always-already concerned with notions of the family – whether discussing notions of the nuclear family, the workplace family or a family of friends. Gerard Jones argues that the sitcom’s very structure is based on the family and domesticity and follows the same narrative structure: “Domestic harmony is threatened when a character develops a desire that runs counter to the group’s welfare, or misunderstands a situation because of poor communication, or contacts a disruptive outside element.” [i] Because of the episodic nature of the sitcom, the problem/solution/return-to-stasis narrative arc must be upheld (with the exception of two-part episodes). For the black sitcoms that feature episodic black gay characters, that problem is homosexuality, which much be expunged and abjected in order to return the family unit to stasis. Working in tandem with Jones’ assertion and sitcom genre theory, this column focuses on Moesha, a nuclear family black cast sitcoms that featured an episode with a black gay male character. Additionally, I am working from Stephen Tropiano’s work on the “Coming Out” Episode, which asserts “once the message [about homosexuality] is delivered, the gay character… typically disappears and, in most cases, is never seen, heard, or mentioned again.” [ii] In other words, when homosexuality appears in the black sitcom, it must be discarded after it has adequately problematized the lives of the series regulars, been solved and return the series to stasis/heteronormativity. With that in mind, I want to turn to Moesha which ran on UPN from 1996-2000 and was described by TV Guide as a “sitcom about a black teen living with her family in L.A., dealing with issues like dating dilemmas and family feuds.” [vi] The episode of Moesha that features a black gay character is the 1996 episode “Labels.” In addition to the series having a primarily black cast, the episodes was also written by black gay writer, Demetrius Bady. Thus, Moesha works firmly within the ways in which I have operationalized the black sitcom. “Labels,” the Moesha episode that features a gay character is described thusly: When Hakeem shows up with his cousin Omar at the Mitchells’ home, everyone fears he could be another Hakeem. Instead he seems to be nice and responsible. Moesha, still grieving about her break-up with Q, goes out on a date with Omar. After attending a movie, they meet Omar’s friend, Tracy, leading Moesha to believe that Omar’s may be gay, Moesha later tells Kim and Niecy he suspicions and it doesn’t take long until everyone in school knows the latest gossip. When Hakeem hears the news, Moesha realizes that she may have jeopardized their friendship. 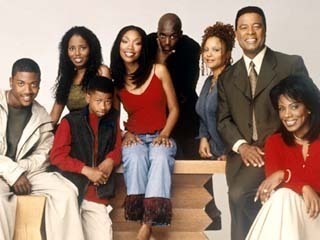 While Moesha is a series that is most explicitly rooted in the nuclear family (mostly because of the title character’s age), the series is mostly about a family of friends. As such, this episode deals with the way the possibility that Omar might be gay effects the relationships of the family of friends. It is significant that Omar never explicitly reveals that he is gay, a move the episode’s black gay writer Demetrius Bady, asserts is rooted in his belief that gayness need not be explicitly disclosed. In other words, the episode has little to do with this gay character per se, as much as it deals with the way in which Moesha’s starting a rumor affects her other relationships. Gayness is a narrative problem that must be dealt with. It literally threatens to tear the family of friend apart. This clip demonstrates that homosexuality must be dealt with so that the heteronormative family of friends can return to their normative relationships. Were it not for the introduction of Hakeem and his “questionable” sexuality, Omar and Moesha would have remained friends. Episode writer Bady had the rare opportunity of writing the episode and receiving no notes from the executive producer or from the network about the content of the episode. But he hypothesizes that the reason there was no interference was because the series executives and writing staff could then say they had done the “gay story” and it was no longer a viable problem to present for the series regulars. As such, Moesha had effectively sealed homosexuality into a single episode and the series could continue with presenting a heterosexist notion of both the domestic family and the family of friends. Moesha works to hermeneutically contain homosexuality to single episodes where they briefly problematize the notion of what a black family is, and what it is not. Homosexuality also seems to be a problem that black cast sitcoms know they should “deal” with, but one that they only want to deal with episodically. The notion that black gay men can only appear in single episodes, where their main narrative thrust is to come out, reifies the notion that black gayness exists outside of the black family. As such, the executive producers of Moesha (and others like them) seem to imply that gayness does not have a place at the black family table. In contemporary sitcoms with primarily white casts like Will and Grace, Ellen, Spin City, Happy Endings and The New Normal, gayness is not dealt with like an afternoon special or as a “very special” episode. In this way, black cast sitcoms seem behind the curve. Despite the work of writers like Demetrius Bady, when the question is asked whether black gay men can be included in the televisual black family, the answer is a resounding no. [i] Gerard Jones, Honey, I’m Home: Sitcoms: Selling the American Dream (New York: St. Martin’s Press, 1992), 4. [ii] Stephen Tropiano, The Prime Time Closet: A History of Gays and Lesbians on TV (New York: Applause Theatre and Cinema, 2002), 192. [iii] Robin R. Means Coleman and Charlton D. McIlwain, “The Hidden Truths in Black Sitcoms” in Mary M. Dalton and Laura R. Linder (eds) The Sitcom Reader: America Viewed and Skewed (Albany, NY: State University of New York Press, 2005), 125.